Reading Roxanne Dunbar-Ortiz’s new book “An Indigenous People’s History of the United States” for a CounterPunch review, I came across this extraordinary passage that deals with the Scotch-Irish, who can more properly be described as Ulster-Scots. They were the Scots that the British used to colonize Ireland—the ancestors of those who marched under the Orange flags during “the troubles”. In the same way that they were the shock troops for colonizing Ireland, they helped to dispossess the American Indian. 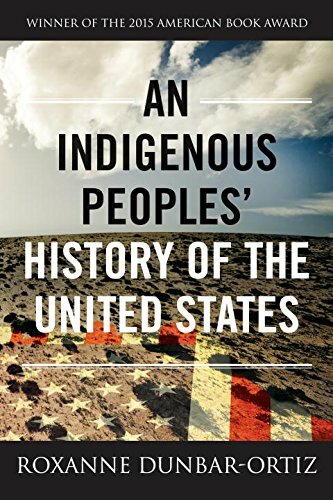 When I first got wind of Roxanne’s book, I mistakenly referred to it as a history of indigenous peoples. She corrected me on the spot—it was instead a history of the USA from the perspective of those who were living here and doing quite nicely at the time. It is a sorely needed complement to Howard Zinn’s history and one that deserves to be on everybody’s collection of essential radical histories of this misbegotten settler state. So it was that the Ulster-Scots were already seasoned settler colonialists before they began to fill the ranks of settlers streaming toward the North American British colonies in the early eighteenth century, many of them as indentured servants. Before ever meeting Indigenous Americans, the Ulster settlers had perfected scalping for bounty, using the indigenous Irish as their victims. As this chapter and the following one show, the Scots-Irish were the foot soldiers of British empire building, and they and their descendants formed the shock troops of the “westward movement” in North America, the expansion of the US continental empire and the colonization of its inhabitants. As Calvinists (mostly Presbyterian), they added to and transformed the Calvinism of the earlier Puritan settlers into the unique ideology of the US settler class.” In one of history’s great migrations, nearly a quarter-million Scots-Irish left Ulster for British North America between 1717 and 1775. Although a number left for religious reasons, the majority were losers in the struggle over Britain’s Irish policies, which brought economic ruin to Ireland’s wool and linen industries. Hard times were magnified by prolonged drought, and so the settlers pulled up stakes and moved across the Atlantic. This is a story that would repeat itself time and time again in settler treks across North America, the majority of migrants ending up landless losers in the Monopoly game of European settler colonialism. The majority of Ulster-Scot settlers were cash-poor and had to indenture themselves to pay for their passage to North America. Once settled, they came to predominate as soldier-settlers. Most initially landed in Pennsylvania, but large numbers soon migrated to the southern colonies and to the backcountry, the British colonies’ western borders, where they squatted on unceded Indigenous lands. Among frontier settlers, Scots-Irish predominated among settlers of English and German descent. Although the majority remained landless and poor, some became merchants and owners of plantations worked by slaves, as well as politically powerful. Seventeen presidents of the United States have been of Ulster-Scots lineage, from Andrew Jackson, founder of the Democratic Party, to Ronald Reagan, the Bushes, Bill Clinton, and Barack Obama on his mother’s side. Theodore Roosevelt characterized his Scots-Irish ancestors as “a stern, virile, bold and hardy people who formed the kernel of that American stock who were the pioneers of our people in the march westwards.”16 Perhaps as influential as their being presidents, educators, and businessmen, the Scots-Irish engendered a strong set of individualist values that included the sanctity of glory in warfare. They made up the officer corps and were soldiers of the regular army, as well as the frontier-ranging militias that cleared areas for settlement by exterminating Indigenous farmers and destroying their towns. The Seven Years’ War between the British and the French (1754-63) was fought both in Europe and in North America, where the British colonists called it the French and Indian War because it was mainly a British war against the Indigenous peoples, some of whom formed alliances with the French. The British colonial militias consisted largely of frontier Scots-Irish settlers who wanted access to Indigenous farmland in the Ohio Valley region. By the time of US independence, Ulster-Scots made up 15 percent of the population of the thirteen colonies, and most were clustered in majority numbers in the backcountry. During the war for settler independence from Britain, most settlers who had emigrated directly from Scot-land remained loyal to the British Crown and fought on that side. In contrast, the Scots-Irish were in the forefront of the struggle for independence and formed the backbone of Washington’s fighting forces. Most of the names of soldiers at Valley Forge were Scots-Irish. They saw themselves, and their descendants see themselves, as the true and authentic patriots, the ones who spilled rivers of blood to secure independence and to acquire Indigenous lands—gaining blood rights to the latter as they left bloody footprints across the continent. During the last two decades of the eighteenth century, first- and second-generation Scots-Irish continued to pour westward into the Ohio Valley region, West Virginia, Kentucky, and Tennessee. They were the largest ethnic group in the westward migration, and they maintained many of their Scots-Irish ways. They tended to move three or four times, acquiring and losing land before settling at least somewhat permanently. Scots-Irish settlers were overwhelmingly farmers rather than explorers or fur traders. They cleared forests, built log cabins, and killed Indians, forming a human wall of colonization for the new United States and, in wartime, employing their fighting skills effectively. Historian Carl Degler writes that “these hardy, God-fearing Calvinists made themselves into a veritable human shield of colonial civilization.”18 The next chapter explores the kind of counterinsurgent warfare they perfected, which formed the basis of US militarism into the twenty-first century. The Calvinist religion of the Scots-Irish, Presbyterianism, was in numbers of faithful soon second only to those of New England’s Congregationalist Church. But on the frontier, Scots-Irish devotion to the formal Presbyterian Church waned. New evangelical off-shoots refashioned Calvinist doctrines to decentralize and do away with the Presbyterian hierarchy. Although they continued to regard themselves as chosen people of the covenant, commanded by God to go into the wilderness to build the new Israel, the Scots-Irish also saw themselves, as their descendants see themselves, as the true and authentic patriots, entitled to the land through their blood sacrifice. Interesting: Official historians of Europe especially of Britain had their focus on the East: Africa was considered a dark continent the Americas and Australia were reserved as continents continents to be discovered. History as we know today is a highly distorted version of human development, distorted by the Euro-centrism of imperialism. True, indigenous peoples of the so called newly discovered continents do not find a place in the history of human development as drawn up by the imperialists. In fact even the entire East including the Arabs, the Persians, the Hindus, the Chinese, the Japanese and a whole lot of oriental people do not find a place in history as narrated by Europeans in general and the Anglo-Saxons in particular. This highly distorted view of humanity and human history was the natural offshoot of capitalist development and imperialism: Marx, Lenin, Stalin and Mao,Castro and other socialist revolutionaries and thinkers had effectively challenged these Euro-Eccentric distortions. Soviet, Chinese revolutions as well as the socialist revolutions of other countries have contributed to these global changes. Even non-Marxian thinkers and writers like Einstein, Shaw, Gandhi, and several others had contributed to the development of such as well as religious leaders of East and West had contributed such a rapidly developing world global view patronized by Left and the working class movement all over the world. Gorbachev’s perestroika and other reactionary movement were aberrations which are being effectively challenged by the Left, all over the world. The evangelicals, pentecostals, and non-Calvinist Baptists were not “newer” in the world of English-speaking protestantism than Calvinism (which included both Presbyterianism, with its exclusive councils of elders, and Congregationalism) but represented tendencies that were well established in the British Isles by the middle of the seventeenth century. During the Commonwealth, Gerrard Winstanley led a sect called Levelers (or Diggers) with roots going back to Wat Tyler and the Lollards of the 14th century. The Diggers pulled down the fences and dug over the hedges erected by landowners and occupied and cultivated what had formerly been common lands. Like the Methodists of the eighteenth century, these religious groupings formed a more radically democratic tendency within the republican political universe of British protestantism generally, and were at least of equal age with it. In some respects, like the anabaptists of Germany, these tendencies predated the protestantism of Calvin and Zwingli and looked back to both religious and political heresies of the middle ages. The terrifying doctrine of double predestination put God’s salvation inscrutably in the hands only of the Elect–those marked out for redemption from all eternity by the hand of God, for whom alone Christ died, with the certainty of eternal torment for all others. This had its populist forms, but proved most convenient in justifying republican elitism, with its broad suggestion that the elders, the Elect, and the righteously (bourgeois and petty bourgeois) prosperous were one and the same.